A Chinese bistro seems to be a relatively recent concept. The idea is to take some of the highlights of Chinese cuisine and turn them into light restaurant fare. That’s all well and good, but it gets interesting when Steve Wynn takes a crack at it. If you don’t know the man, he doesn’t mess around when it comes to building a casino, especially when that casino carries his name. So while I was waiting for my room to be ready, I decided to try a late lunch at Red 8 in the Wynn hotel & casino. Like Tao, Red 8 takes full advantage of the Chinese tradition of red and black appointments, not to mention the minor obsession with the number eight. Similar to Ping Pang Pong, Red 8 offers a wonderful view of schmucks pouring their money into slot machines, although The Wynn offers a better quality and higher class schmuck than the Gold Coast Casino. Once my eyes stopped burning from the flaming red furniture, walls and cabinets, I decided on a variety of lunch items. I love how these are called steamed prawn dumplings. Wynn might make the effort to make sure all the appointments and furnishings are the real deal, but he still gets the restaurant to dumb everything down for the hapless American. There are no har gao in Red 8, only steamed prawn dumplings. The scallion dumplings are a dish I really can’t complain about. 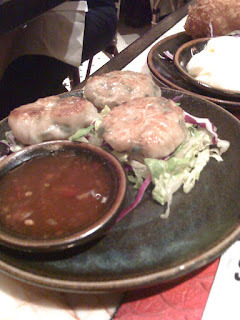 Pan fried and with a tasty sauce, I would order these dumplings again. These spare ribs are a point of contention for me and my mother. She loved them, especially the slivers of peppers as a garnish. I was unimpressed. There was no fat on these ribs, it was nothing but lean meat so the gaunt patrons of the Wynn wouldn’t feel guilty about eating pork. 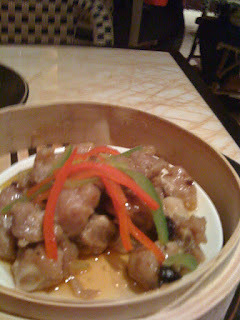 Real dim sum spare ribs should have some fat on them and be a little greasy. I always thought of this dish as a way to use up some of the trimmings from the larger cuts, sort of the Chinese version of rib tips bbq. 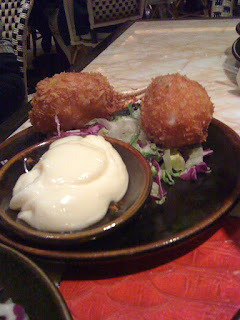 Crab claws are always tasty, as most fried seafood dishes are. I don’t know what the hell that big bowl of mayonnaise was for, I’m a firm believer that all things Asian & fried should be enjoyed with liberal amounts of chili sauce and soy sauce. 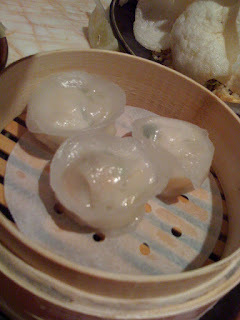 Like the scallion dumplings, these scallop dumplings were quite pleasant. 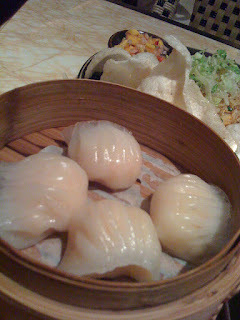 Like the “steamed prawn dumplings” the proper Chinese name for this dish was not given. However, I don’t actually know the proper name for this dish, so I’m just going to enjoy the dumplings. I realize that spicy is a relative term but anyone that calls this dish spicy is a big puss. Spiciness aside, this was an average rice dish. 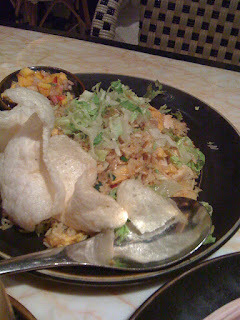 Aside from the side of mango chutney, I don’t see what made this Malaysian fried rice. So Red 8 was a pretty decent lunch, but there are many more things that I would try in Las Vegas before I would head back.